Certified to EN12492 Standard. 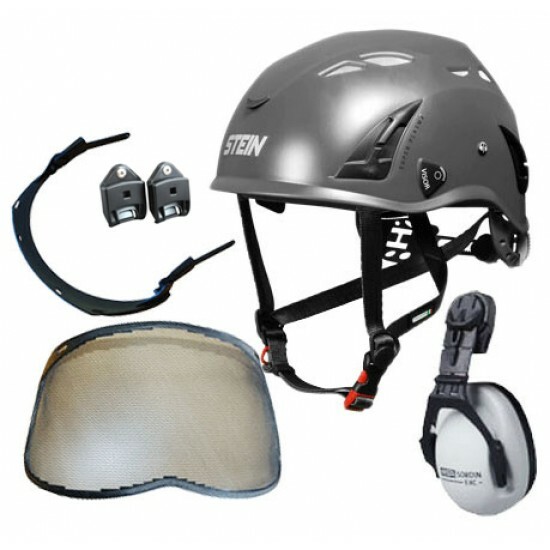 This helmet has an innovative design, light, compact, comfortable. Well ventilated with its 10 air intakes that keep the head cool. All the air intakes are fitted with a protective grille. The visor system meets EN 166 for safety eye protection and EN 14458 for use by the emergency services. The visor mounts to the helmet with a non ferrous connector and has an up and down positioning lug to prevent visor creep. The cradle is provided with the UP-n-Down technology. This allows adjusting the frame both in terms of inclination and height. Rapid size adjustment system allows size adjustment with the helmet fastened on the head. Twin adjustment system acting either by turning the wheel or by pushing the two rubber coated flaps towards the centre. The inner padding consists of two different pieces, head-band and disc. The inner padding is removable/replaceable; it is washable by hand or in a washing machine at 30°. The new liner is made with a Polygiene fabric that inhibits the growth of odour producing bacteria. The chinstrap is fixed to the outer shell without the use of metallic rivets. With quick adjustable buckles for easy adjustment. Please note that when purchasing this item for personal use it is Zero-Rated for VAT. Employers purchasing for their employees must select the VAT option. Availabe in various colours, please select your chosen colour from the drop-down list.